Polish author; born at Brzeszticzka ( ), Volhynia; died in 1612. He was the author of the following works: "Ḥokmat Manoaḥ," glosses to the Talmud (printed in the Cracow 1602-5 edition of the Talmud, and separately at Prague, in 1602, by his son); "Menoaḥ ha-Lebabot," commentary to Baḥya ben Joseph's "Al-Hidayah ila Fara'iḍ al-Ḳulub" (Lublin, 1596; frequently reprinted); "Manoaḥ Maẓa Ḥen," on the title-page of which the emperor Rudolph and King Matthias are mentioned. 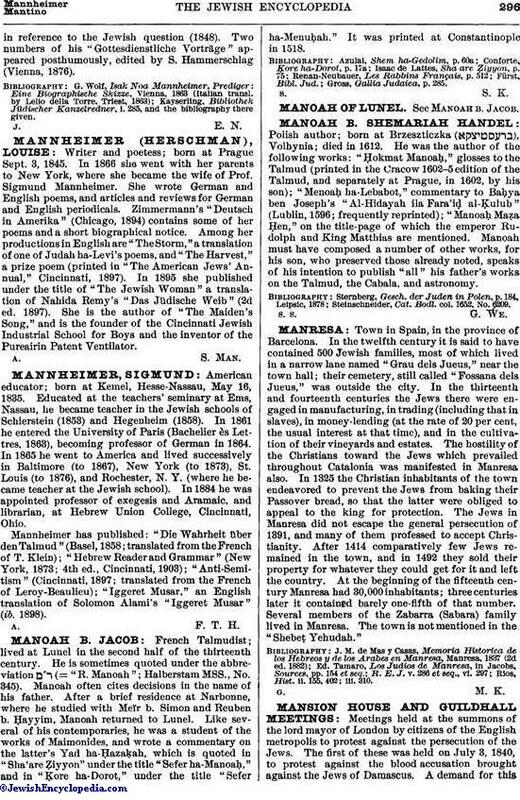 Manoah must have composed a number of other works, for his son, who preserved those already noted, speaks of his intention to publish "all" his father's works on the Talmud, the Cabala, and astronomy. Steinschneider, Cat. Bodl. col. 1652, No. 6209.